My relationship with the terminal—especially Windows PowerShell—has been a bit of a roller coaster. I first discovered the terminal when I heard about Python and didn’t know anything about anything. Like the average person who uses computers for games and applications like Excel and PowerPoint, I went to the site, downloaded the installer, installed it, and clicked the icon. Imagine my horror when something like this popped up. Where are the buttons? What’s with the old-timey font? What do I do with my mouse? After beginning to program more and more, and learning about the terminal, I began to love Bash. Is it archaic? Yes. Are the commands nonintuitive and difficult to remember? Heck, yes. For some reason, this just made me love it more. I had to work hard at it, and typing a bunch of what appears to be gobbledygook that had powerful results made me feel like a wizard. For instance, typing du -sk * | sort -n | tail (See? Gobbledygook!) is a really fast way to see the top 10 largest directories in your current directory. As I learned more, I was able to customize how it looked and get fonts, colors, and prompts that made the terminal that much more inviting. No problem, I thought. I’ll just go to the Preferences screen. Oh, no. We’re not in Kansas anymore. Not exactly what I was used to. So I went into PowerShell and tried to do some simple things. Some things worked fine! ls, cd, and mkdir all worked like I was used to. But I couldn’t figure out why setting the $PATH was so hard to do. And what was with all of these backslashes? How come I couldn’t sudo? More and more little irritations that kept reminding me that I wasn’t using Bash kept cropping up. I gave up and installed Cygwin, which allowed me to have a Bash experience on my Windows 7 computer. Except not quite. Everything I tried to do to get back to Bash on my Windows machine was just … not quite right. Finally, I tried another approach and began to work on learning PowerShell the right way, from the beginning, as another language. As I learned, I found myself buying into the whole PowerShell philosophy and noticing the things that were a little bit nicer than when I was using Bash. Keep in mind, like everything, PowerShell is just another tool in the toolbox, and whether or not it’s the best tool really depends on the situation. I’m not going to give you a complete lesson on the basics of the PowerShell language. I’m also not going to spend a lot of time telling you how to install PowerShell, either. This set of docs is fairly comprehensive, and it’s also a good cheat sheet for reference later. My goal here is to show you how things translate from other shells and get you started on your own PowerShell journey, so I’ll assume that you have at least a little bit of experience with a shell language like Bash. There are mental shifts away from how Bash-like shells do things that you need to make when you’’re starting to learn PowerShell. If you can get past your initial gut reaction of disgust when you see these differences, you might start to see that they actually make you more productive. This is probably the biggest difference that you have to get through your head. In Unix shells, everything is plain text. This makes things nice because you can expect text input into all of your scripts, and you can know that if you output text, everything will probably be OK. However, the downside is that this makes inspecting specific data a nightmare of text parsing, and it makes working with anything other than text (floating point numbers, anyone?) a real pain. Side note: I put a PowerShell prompt (PS> ) in front of each command so you can tell what is output. Every line that starts with “PS>” is something for you to type. Every line without it is output. Now you should see a shorter list, reverse sorted by CPU time. If you’re already getting itchy because all of these commands and options are so long, I address that in a couple sections. Stay with me. The important thing to pay attention to here is the headers at the top of each column. Each row of this table is actually a System.Diagnostics.Process object, not just a row of a table. Don’t believe me? Just check! See there? The Get-Process command returned a list of Process objects, and we were able to select the first one through indexing (without splitting the output by \n!) and shuffle that through the Get-TypeData command. These items being objects gives us some power. What if we only wanted their ProcessName? See how easy it was to access that? We didn’t have to cut the fields delimited by tabs or colons and count which field we wanted (1 … 2 … 3 … 4 … 5!). We just told it that we wanted the ProcessName attribute! No more parsing, splitting, joining, formatting output, etc. Another side effect of being on top of .NET and having everything be an object is that everything must have a type. This may be confusing coming from a Bash shell that only has strings and strings that might get interpreted as commands. Here’s what it does for us. PowerShell usually does a pretty good job of trying to figure out the types that you mean so you can feel as dynamic as with other shells and scripting languages and not have to strictly have types on everything. But, if you really want to enforce a type, you can do so by prepending the object with its type in square brackets. 4   # An integer. The conversion only applies to the "2"
It’s so long! And capital letters? Come on. The good news is that you don’t have to type the whole thing out if you don’t want to. But, before I get to that, let me explain the rationale behind it. The creators of PowerShell wanted the commands to be extremely intuitive, such that you could almost guess the command that you needed. This would be basically impossible in Bash. There’s no way you could guess that cat is the common command to read a file into the terminal. Once you learn it, it makes sense that it’s short for “concatenate,” but it’s not intuitive by itself. PowerShell commands were designed after a simple pattern: “Verb-Noun.” The creators of PowerShell tried to keep the number of verbs to a minimum. Common ones you’ll see are Get, New, Add, Clear, Export, Remove, Set, Update, and Write. The nouns are also usually pretty intuitive: Process, Item, Object, Date, Job, and Command are a few. This consistent pattern allows someone to look at a script that has commands in it that they’’ve never used and still have some idea about what the script is doing. The other benefit of keeping a consistent pattern is that PowerShell can detect the “verb” and “noun” sections of commands. For example, do you want to see all of the commands with the verb “New”? In fact, if you know what you want to do, but you can’t remember the command for it, Get-Command is one of a few commands that will be your friend. What if you wanted to see what kinds of things you could do to “Job” objects? Yes, the commands are longer to type than their equivalent, typically terse Bash commands, but with this additional verbosity comes ease of use, less memorizing of commands, and helpful tooling to keep you productive. Even though the commands are long and verbose, PowerShell knows that people using the terminal are lazy (in a good way! ), and it doesn’t want to get in your way. It has a ton of built-in aliases to make your life easier and make you feel more comfortable, and it can actually do some aliasing on the fly. Remember that command we ran earlier to see all of the files in our directory? Using these aliases during shell sessions can keep you productive and save your fingers from wearing out without giving up the functionality and readability of the longer commands they stand for. Just a word on best practice: When you’re doing command-line work by yourself, feel free to use as many aliases as you want. Alias it up. Get your productivity on. However, if you’re writing a script or sharing code with someone, it’’s probably best to type the whole command and whole flag-names out. Trust me, your future self and coworkers will thank you. 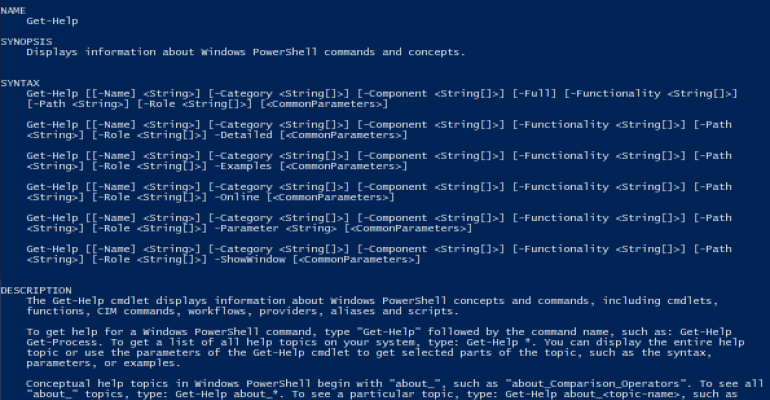 While the best way to learn PowerShell is to dive in and practice, I’m going to share some commands with you here that are really helpful when you’re a little stuck. This command will provide you with more information about available commands. You can zero in on what you want by specifying -verb or -noun parameters. In order to get more information about one or two particular commands, pipe the output into Format-List. This will give you the options, location, and some other useful features. Get-Help is roughly the man of the PowerShell world. Are you starting to see the benefits of intuitive commands yet? Actually, Get-Help has quite a few useful flags, as well. It’s probably a good idea to take a look at them using the method we discussed above. If you know what data you want, but you just don’t know what it’s called, or if you aren’t even sure what data is available to you, these commands will help you “see” your objects a little better. Select-Object is your general purpose stuff-whittler. You can specify particular attributes you want, how many you want to see, and which ones. Just Tell Me How to Do the Thing! This last section will just be a few snippets for the impatient among you. If you’re just trying to get one darn thing done in PowerShell and you can’t make it work, these tips should hopefully help. PS> Get-ChildItem -filter *.rb -recurse . In PowerShell, a lot of things get treated like file locations—and the environment variables are no exception. These special groups of file-like variables are called PSDrives. In the same way you can ask the C: drive what file is at “\Users\ryan\Desktop” with a Get-ChildItem C:\Users\ryan\Desktop, you can do the same thing with env:, the environment PSDrive. This second way is probably the most popular way to get the PATH variable. If you’re into command lines and you’re anything like me, you’re probably wondering how to customize themit. The answer lies in the $profile. Here are a couple of useful settings you might like. # you should define a function instead. Set-Alias touch New-Item  # old habits die hard, amirite? # You can customize your prompt! # ... see the next section for more details on this. There are two ways to do this: the simple way and the complicated way. return "POWERSHELL LEVEL OVER $histCount THOUSAND!!! >"
This is an amusing way to return the number of inputs that you’ve already typed inside your prompt. Whatever string you return is what gets set as the prompt. $gitBranch = git branch | Select-String "\*"
Write-Host -ForegroundColor yellow "`n $loc"
Write-Host -NoNewLine "PS [$histCount] $gitBranch ->"
This is a tough one. 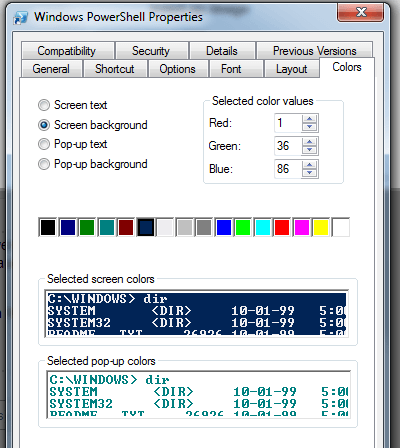 Like I mentioned above, on Windows, PowerShell runs in a window with not very many customization options. Especially for someone who is used to being able to tweedle every knob of their text editor to their liking, it’s almost painful. There are two pretty good alternatives, though. Cmder: This one is built on top of ConEmu, which is a pretty popular terminal emulator for Windows. If you like Notepad++, I think you’ll really like this, because it feels similar. The best place to go is definitely the official docs. There’’s so much content there that they should have the answers you need. Since PowerShell is now open-source, you can also check out their GitHub repositories. There are some more great docs and getting started guides there as well. The goal of this article is to show that just because PowerShell is different from what you are used to, it’s not necessarily bad. If you take the time to really dig into the differences and learn the reasoning and design decisions behind them, you’ll start to see their strengths and value. You might actually miss dealing with typed objects in your command line when you go back to other shells. Having to parse text streams might start to feel archaic. You might find yourself using longer, more consistent function names everywhere as you realize how nice it is to be able to read and understand your scripts six months after you write them. Or, you might simply stop telling people how much you hate PowerShell whenever they mention it.